Born in Navaro around 1105; died in Italy around 1200; cult confirmed in 1859. 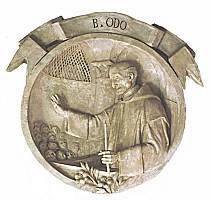 Blessed Odo, a Carthusian monk, was prior of Charterhouse at Geyrach in Slavonia. He resigned due to difficulties with the bishop and became chaplain to a convent of nuns at Tagliacozzo in Italy, where he died at a very advanced age.